There’s no doubt that seniors require different skin care and cosmetic options than their younger counterparts. Seniors have spent many years in contact elemental impurities in the air, not to mention frequent exposure to the sun, which can further age skin over time. 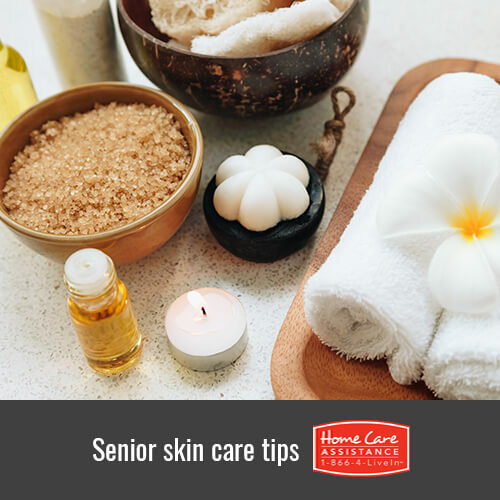 Fortunately, live-in caregivers in Rhode Island can help their senior loved ones rejuvenate and maintain their skin with the following tips and recommended products. One of the most effective ways for Rhode Island home care providers to help seniors maintain healthy skin is to make sure they stay hydrated. Always have a glass of water available and encourage sipping throughout the day. Hydration allows the skin cells to function properly and staves off the appearance of dry and wrinkled skin. Next, it’s important to moisturize the skin often. Aged skin can tear easily and healing will take longer than it used to. Keep skin moisturized with products that contain emollient ingredients such as lanolin, lactic acid, glycerin, petrolatum or natural oils such as olive or almond oils. Vitamins A, C, and E are also great for the skin, although on ingredient lists they may appear as retinol, ascorbic acid, and tocopherols, respectively. Avoiding heavily scented or colored products is a good idea as most allergic reactions are generally caused by the colorants or added fragrance. Aquaphor – These products are particularly emollient and come in various forms such as skin lotion and petrolatum ointment. Burt’s Bees – This product line is readily available in stores, as well, and they also make some fragrance-free skin lotions. Additionally, they make lip tints and lipsticks that not only soothe the lips but also will add color, if desired. Neutrogena – This is a hypoallergenic brand that not only makes body and hand lotions for skin care but cosmetic items, too. They manufacture tinted moisturizers for face, lip color, eye shadows, blush and mascara. All are perfect for sensitive skin. Avon – This company makes a Moisture Therapy product line that includes hand and body lotion. The intensive healing and repair body lotion and hand cream are completely fragrance-free and hypoallergenic because they contain hydrating glycerin. All of these products are readily available and also very reasonably priced, which means your loved one can maintain his or her healthy skin without breaking the bank. To learn more about skin care tips for your loved one, turn to Home Care Assistance of Rhode Island. In addition to helping seniors age in place in comfort, we also provide comprehensive dementia, stroke, and Alzheimer’s home care in Rhode Island. Learn more by calling (401) 284-0979 and schedule a free in-home consultation today. Is Plastic Surgery a Safe Option for My Senior Loved One?